Relaxing restaurant in a fashionable hotel. The service for this class of restaurant was appropriate. The menu had some stunning, top class elements, some combinations were not harmonious imho. 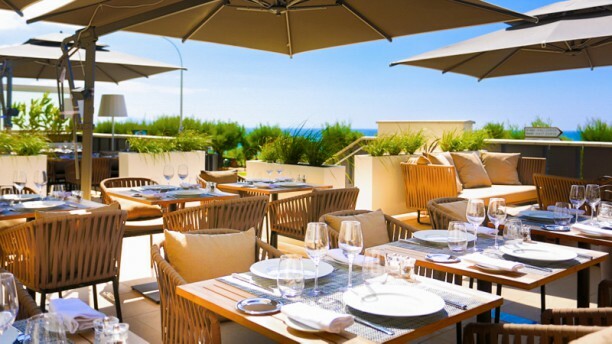 If you are in Biarritz, my recommendation, give it a try! Very nice place with great staff in a beautiful setting. The staff here are friendly and welcoming and for such fine dining the place is very relaxed. My family and I all enjoyed our food , everything was delicious. Four people 3 courses with a bottle Champagne and a bottle of wine was 330 Euros. No atmosphere, overpriced & food was disappointing. This could be a an excellent restaurant, hotel needs to step up & invest some effort in the restaurant. Though our reservation was the first in their list, they could give us the table we didn't like. When asked about another table, the waitress said that was the only one thay had, but at this time there was absolutely noone in the restaraunt, we were the first to come. She looked tired and unhappy to see us. The restaraunt appeared to be a simple hotel restaraunt with terrace facing the road. This was enough to deside to leave without dinner.